Digital Signage is becoming a very valid emergent technology of the future and is scheduled to grow every year and best of all it is becoming more and more affordable. So you ask, what exactly is it. To keep it simple, it is the ability to feed content or material through a digital means such as a LCD TV. For quite a few years, you have seen a lot of it in places like large airports with rotating images, ads, and information. Now you are starting to see it in your everyday life and the real benefit is instead of spending a bunch of money on a sign or advertisement that is going to become dated, you have the ability to create fresh content with regularity and ease. A great example; you are a business owner and you own a hotel. Maybe you would like a big display in your lobby that feeds a great deal of information, simultaneously for your guests. Things such as a weather forecast, hotel schedule (special events with time and location as an example), area events to help make the most of their visit, and maybe a rotating ad that you have sold to various local restaurants to encourage patronage at their restaurant. It can be used anyway you want. That is what is great about digital signage; it is a very flexible format. 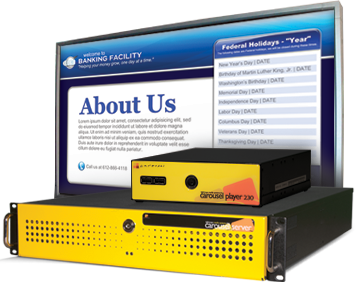 To find out more how we can assist us with your digital signage needs, give us a call. We have the ability to handle the process from start to finish and give you a service that is flexible and easy and can generate income to pay fot itself.